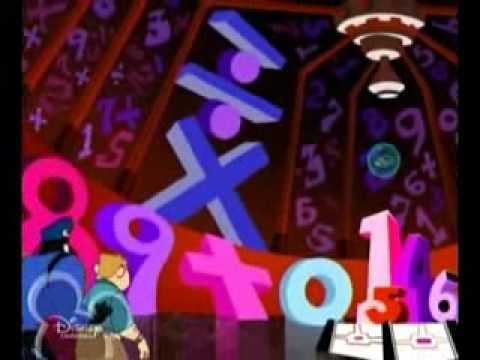 This episode of the Disney animated TV series "Kim Possible" is a comic book parody featuring a mathematical villain. 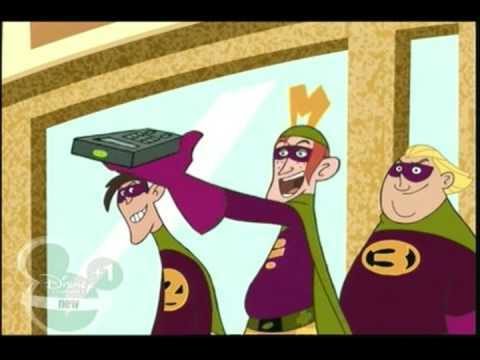 As an English assignment, Kim Possible and Ron Stoppable have to write a paper about their "hero". Kim is writing about her dad, a brilliant physicist. In explaining why he would not want to write about his father, an actuary, Ron says "who would want to read about math in English?" (Visitors to this Website would, Ron!) In fact, Ron's nerdy dad is portrayed as not being particularly heroic. For instance, when he appears wearing a scorched fire-fighter's outfit people are surprised to hear that he had volunteered at the fire department, but it turns out he had only volunteered to cook in the fire house -- and had burned the food besides. So (after finding that neither Kim's neurosurgeon mom nor the CEO of "SmartyMart" are available), Ron decides to write about a real superhero, Go Man. As it turns out, Go Man's villain at the moment is The Mathter, a mathematician seeking vengeance after he was denied funding for his "unethical mathematical experiments". Ron says "I always knew that math was evil." The Mathter is prone to using math puns and mathematical weapons: he subtracts people with his calcu-laser, tosses dangerous decimal points at them, and uses "Brackets!" as an interjection. Through a series of events so contrived that even the characters note how unlikely it is, it is Ron's number crunching father who saves the day. "What kind of hero are you?" the Mathter asks him. "I'm no hero, I'm actuary of the year!" Mr. Stoppable responds. Of course, Ron now recognizes his father's skill with numbers and uses him as the subject for his essay. This episode is currently available for free on YouTube, but such postings tend to be temporary as Disney likes to enforce their copyrights. So, do not assume it will stay there for long. Thanks to Cora Wright for bringing this fun bit of mathematical fiction to my attention!